tgh buat persiapn terakhr 4 my assgnment..
sambil berjln blk prep mlm..
"waaa.. mira,, tgk 2,, salji dh trn laaa.."
bile igt blk,, kngn 2 sgt lucu kn?? 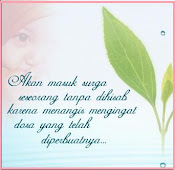 haaa.. itu laa yg sll one of my best friend always said 2 me..
ye laa,,i can't say it 2 her,right? bile time hujan rintik2 kt cni,, it will remind me to her..
nnnnn,,, i'll start typing something to send her an email!! i hope all is well with u over there! !